Mini Wienermobile, that is. 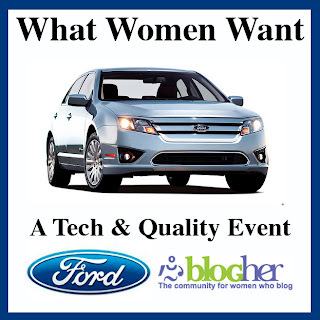 This is a family-friendly blog for Pete's sake... what did you think I was referring to? So make sure you gather up all the kids to check out these pictures. 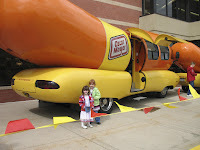 Oscar Mayer's Wienermobile was making some stops at the local Hy-Vee grocery stores this past weekend. DH and the kids had been Mother's Day shopping on Friday and saw it as they were driving around, but didn't stop to get a closeup look at it. When we read in the paper that it was supposed to be at the store closest to our house, I insisted that we go. Why? Because I hadn't seen it yet. And I didn't have pictures of the kids with it. So when we arrived at the store, we didn't see it. DH said "I thought you said it would be here." Well that's what the paper said. As we pulled into the parking lot, we finally caught a glimpse of it. Well sort of. I was like "OMG, it's tiny!" We joked that it was the Little Smokies version of the Wienermobile. 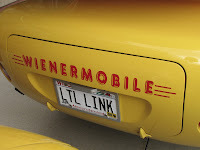 It was actually a mini-version of the Wienermobile built on a Mini Cooper. Considering the basket of coupons for Oscar Mayer's new Mini Hot Dogs, I guess it all made sense. It was actually really cute and the girls thought it was neat. 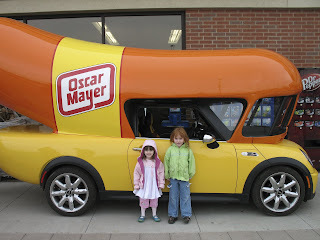 DH and I knew that it wasn't THE Wienermobile, so we talked to the Oscar Mayer rep and found out that it would be at another location near our house on Sunday. So guess what we did after going out to lunch for Mother's Day. Yup. We headed to the other Hy-Vee. Glad we did, because it was worth the extra trip. 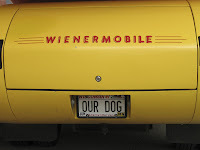 My first time up close to the Wienermobile made me feel like a kid. 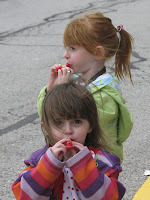 And the trip wouldn't be complete without the trademark Wiener Whistle that they hand out to kids of all ages. It was a fun experience and I hope the girls remember it for years to come. What better way to spend Mother's Day? That is soooooo cool. I want to be a kid in your family! I guess it would have to be a tofu pup though. A free hour with personal trainer is AWESOME!!!! I have my own routine down but it's always fun to learn more and get more input. Our gym has a special right now, where you get 5 sessions with 5 different trainers. It's so fun to talk with someone else who hits the gym as often as I do. I've seen the Oscar Mayer vehicle on the freeways here. It's always such a kick to see it. That is so cool! I didn't know they had a little one!! *G* Looks like the girls had a blast! I've always wanted to see that myself! 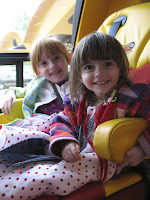 Cute , looks like the girls had lots of fun ! I read that in the paper about the different locations but I had work...boooo! Glad you had a great time and thanks for the photos! You guys are the funnest family I've ever known. You are always out doing fun things I'd never think of : ) On a different note, did you ever received your Basic H? I never know with Shaklee's delivery. So cool...I wish I would have known about it! I would have taken the kids! yah. That kinda scares me!!! i wrote a resume for one of the Wienermobile drivers a few years ago. It had never occurred to me that this was a real job, but it is -- they usually hire kids right out of college who spend a year or so driving around the country in a gigantic rolling hot dog. What a fun job. Here's a really good video on the Oscar Mayer Wienermobile. It's really funny!